Wet and muddy, iced-over and slushy, even California’s grayest winters are bejeweled with citrus. From blood oranges to Buddha’s hand, winter in California brings an abundance to our tables. Before the advent of human migration and trade, citrus was originally a genus made up only of three plants: the mandarin, the pomelo, and the citron. These three trees cross-pollinated over time to bring us hybrids such as grapefruits, lemons, and oranges. A few notes on cultivating citrus: While frost is not likely to kill a healthy, mature citrus tree, it can damage trees when temperatures drop below 29°F for longer than 30 minutes. To care for your trees against frost, wrap the trunks in several layers of cardboard and leave until the last frost in your region, leaving pruning until early spring. 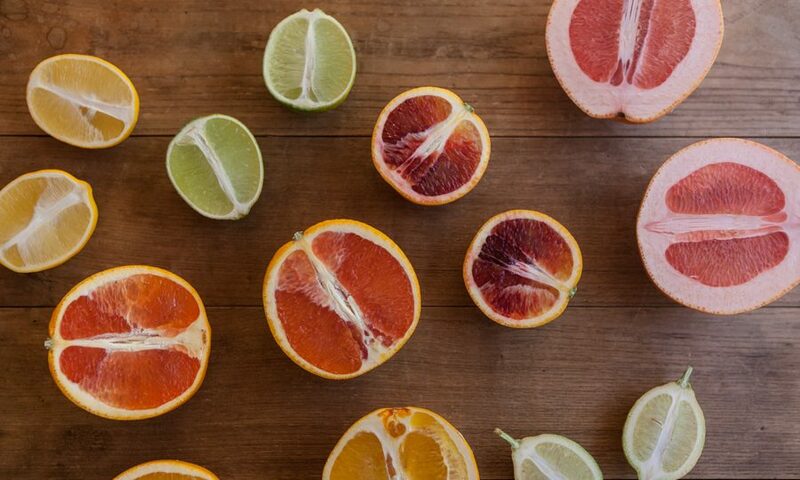 In the meantime, here is a guide to some citrus that grow closer to home here in Northern California. The Buddha’s hand is an aromatic citrus fruit that is all peel and pith. Considered a symbol of good fortune, it is a popular New Year’s gift in China and Japan. When shopping for Buddha’s hand, look for bright, firm fruits with smooth skin and avoid any with bruises. Store at room temperature, in a single layer on a plate, for three to four days. For a savory, aromatic snack, Michelle McKenzie’s Dandelion & Quince offers a recipe for marinating olives with olive oil, cracked fennel seed, shaved Buddha’s hand, and chile de arbol. For something sweet, try candying the rind in sugar syrup and dipping in dark chocolate. Buddha’s hand can also be used to infuse spirits. Kevin West’s Saving the Season suggests cutting the “fingers” away from the base of Buddha’s hand, splitting them lengthwise, and then pushing the citron pieces into a bottle of vodka, allowing to sit for one week before adding to a martini or other cocktail. Introduced to the U.S. from Asia in the early 1900s, the Meyer lemon is a hybrid between a lemon and an orange, most likely of the mandarin variety. As a result of the hybridization, they have lower acidity and thinner skin than lemons. Available early in the citrus season, Satsuma mandarins are sweet, seedless, and easy to peel. As the growing season continues, colder nights trigger natural color production in the fruit, so fruit later in the season is darker. The quintessential orange, navel oranges grown in California tend to produce thicker-skinned, more brightly colored fruit. As they are grown by grafting, navel oranges are all direct descendants of the same tree. Cara Cara is a variety of navel orange with pink flesh that is sweet and juicy like the navel, but less acidic. Similar to red cabbages and red grapes, the color in blood oranges come from anthocyanins in the flesh of the fruit. Italy and California are the top producers of blood oranges, as the color develops with cooler temperatures at night. Easily mistaken for lemons because of their yellow color, sweet limes are commonly used in India to sooth sore throats. With less acid than regular limes, Palestine limes can also be sliced and added to water instead of lemon, or just eaten as is. A cross between a mandarin and a papeda (a subgenus of Citrus), with a flavor somewhere between a lemon and a grapefruit, yuzus are about the size of mandarins but with yellowish-green dimpled skin and large inedible seeds. This Japanese fruit is the basis of ponzu sauce, and it’s mild sourness adds a bright note to marinades and salad dressings. This entry was posted in Eat Good Food and tagged citrus, winter.